Joanne Robinson Vey, 63, passed away on August 9, 2014 at Brigham & Women's Hospital / Dana Farber after a brief battle with Cancer. Joanne was born in Needham, MA, the daughter of the late William and Bertha (Methven) Robinson. She was raised along side her late brother, John Robinson of Sandwich, MA. 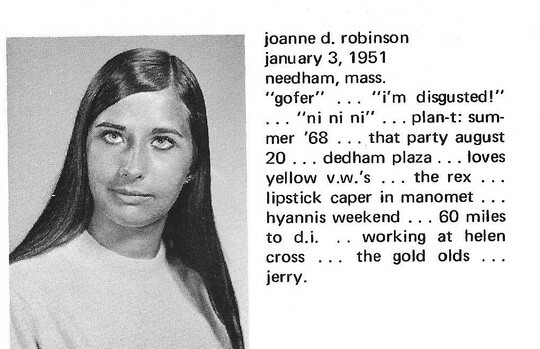 Joanne was a member of Needham High School Class of 1969 and went on to graduate from Chamberlin College with an associates degree. Joanne worked as a receptionist at Mill Metals in Manchester, NH. In her free time Joanne enjoyed cuddling with her dachshunds Oliver and Elwood, chatting with her best friend Janice Beaton Barrington, donating blood and platelets and spending time with her family. She also enjoyed serving her community as supervisor of the Checklist. Joanne enjoyed donating her time and efforts to good causes. She served as PTA president and started the annual Sandown PTA auction. Joanne also took on the surrounding towns. She helped her daughter in efforts to raise money and collect toys for Christmas Toy drives that benefited impoverished children in Manchester, NH. If there was any way Joanne could help or donate she would. Even in her death she continues to give as an organ donor to further research cancer treatment. Joanne is survived by her loving husband Charles F Vey, a son David and his fiance Kimberly Contreras of Los Alamitos, CA: granddaughter Camille Rosalie Vey; daughter Lauren Vey Fournier and her husband Daniel Fournier of Nashua, NH. A "Celebration of Joanne's Life" was held at the family residence in Sandown, NH on August 16th.